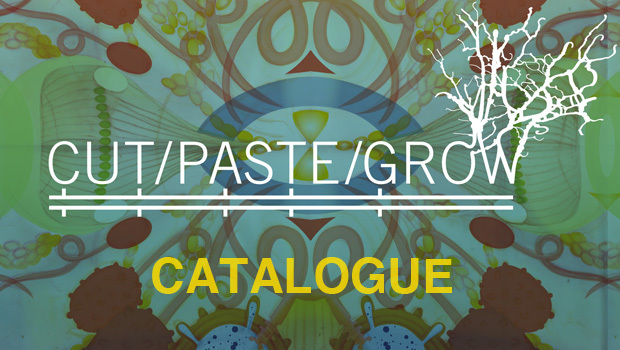 The art of CUT/PASTE/GROW has been bound with new essays in a gorgeous catalogue. Join us at Genspace to celebrate the catalogue release! Before the party, join our panel discussion on “The State of Bioart Today.” Suzanne Anker, bioartist and chair of fine arts at The School of Visual Arts, and Nikki Romanello, bioartist and CPG contributor, will share the stage with the show’s curators. The panel (and party) begins at 7 PM, Saturday, August 16. Genspace is located at 33 Flatbush Avenue, Brooklyn (Nevins/Dekalb stations). A limited, numbered run of catalogues will be on sale at the party. Suzanne Anker is a visual artist and theorist working at the intersection of art and the biological sciences. Her work has been shown both nationally and internationally including the Walker Art Center, the Smithsonian Institute, the Phillips Collection, and P.S.1 Museum. Her books include The Molecular Gaze: Art in the Genetic Age and Visual Culture and Bioscience. Chairing SVA’s Fine Arts Department in NYC since 2005, Ms. Anker continues to interweave traditional and experimental media in her department’s new digital initiative and the Nature and Technology BioArt Lab. Nikki Romanello collects and observes plant and animal remains to familiarize herself with the function, texture, form, and the fragility of natural artifacts. She combines art and science with the intention of bringing science into culture. Her work has appeared in the New York Hall of Science, Rivington Design House, and Hot Wood Art Center, among others. Currently, she works as a TIG welder for Token NYC, and teaches at Brooklyn Brainery.